A web site is a dynamic document. The contents of which need to scale and change shape depending on which monitor it is viewed on. A big factor which impacts a web design is screen resolution. This chart illustrates the most common resolutions dimension in use today. Click here to see an HTML version of this chart. 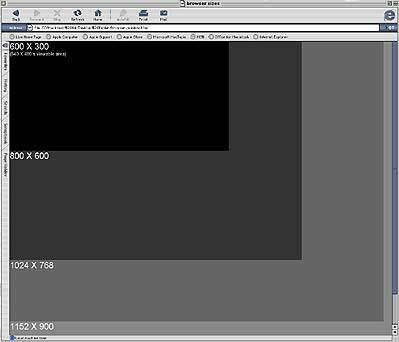 Drag the lower-right corner of the resulting window to the lower-right corner of you monitor. You can use it to measure your own monitor resolution, but remember not everyone sees the same thing as you. Some users may only see a small portion of this chart, while others will can see it all. The web site templates designed by Mihalyo Studios will scale and maintain integrity at any resolution. Click here to see the monitor reolution chart.